From the slums of Correllia to the criminal underworld of the galaxy, young rogue Han Solo (Alden Ehrenreich) makes a play for his dreams: to be the best pilot in the galaxy. 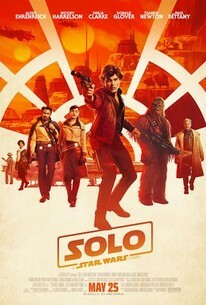 Drawn into a dangerous heist by the thief Tobias Beckett (Woody Harrelson) and accompanied by new friend Chewbacca (Joonas Suatomo), Han may have bitten off more than he can chew. Lucasfilm’s second Star Wars Story spin-off comes to cinemas under a small cloud of unrest: its original directors fired, much of the film re-shot comparatively late in the day, and rumours circulating of floundering actors, an unhappy set, and a presumed poor quality. It is becoming an unwanted trend for the Star Wars franchise, with Solo marking the fourth time a director has been replaced after Josh Trank was dumped from a Boba Fett movie, Gareth Edwards was replaced for Rogue One reshoots, and Colin Trevorrow dropped from helming Episode IX. Solo has ultimately been directed by Ron Howard, who reportedly shot or re-shot 80 per cent of the final film. Original directors Christopher Miller and Phil Lord have been left with an executive producer credit. I write all this, somewhat perversely, to now tell you that none of that behind-the-scenes turbulence should matter to you. It’s less important knowing how the cake was made than it is knowing how it tastes. In all honesty, Solo tastes pretty good. It lacks the ambition of The Last Jedi and the bleak tonal shift of Rogue One, but it tells a pretty exciting story with plenty of enjoyable characters. It’s arguably the most straight-up fun Star Wars picture since the 1980s. There is a major problem with the film, of course, in that it’s a prequel. Prequels are simply not very interesting. They rarely deliver valuable back story; instead they deliver trivia. It makes no difference to Han Solo’s story in the previous Star Wars film to learn how he got his name, or how he met and befriended his loyal co-pilot Chewbacca, or how he won the Millennium Falcon from rival smuggler Lando Calrissian. To the hard-core fans it may be fun to know, but it’s completely unnecessary at the same time. Solo never quite emerges from the sense that more interesting and original films could be made out of the Star Wars universe than this. On the other hand, if Lucasfilm are intent on back-filling character trivia, it is hard to imagine a film that does it much more effectively than Solo. Solo is simply enormous fun. It is packed with shoot-outs, chases, and spaceship battles. It leans heavily into nostalgia, so that each time it hits another predictable story beat there is an immediate wave of delight. John Debney’s musical score underlines that, with well-placed portions of the classic John Williams themes dropped in at every relevant opportunity. It gathers up most of the moments from Han’s youth an average Star Wars fan would expect to see, and then threads them through a classic science fiction heist adventure. Alden Ehrenreich is excellent as Han Solo. He picks up possibly the most impossible screen acting job since Zachary Quinto played Spock, and he does a deeply impressive job of it. He is immediately recognisable as Han, and within minutes he’s a comfortable presence at the film’s centre. Critically, however, he plays Han – while some of the overall tone of Harrison Ford’s iconic performance carries across, Ehrenreich wisely develops his own portrayal of the role. Joonas Suatomo is similarly strong as the Wookiee Chewbacca: it’s possibly less noticeable given the full body alien costume, but his version of the character is a lot more expressive and humorous than that of original actor Peter Mayhew. That is helped a lot by the film’s screenplay by Lawrence and Jonathan Kasdan, which sparkles with a familiar snark and wit. Supporting actors like Woody Harrelson, Paul Bettany and Thandie Newton all do a solid job. Emilia Clarke is less convincing, and her slightly wobbly performance as Han’s first love Qi’ra fails to sell one of the film’s most critical plot threads. Thankfully that is more than balanced by Phoebe Waller-Bridge’s fantastically militant droid L3, and Donald Glover’s wonderfully charming turn as a young Lando Calrissian. The film runs a strong line in humour and warmth, two things that felt weirdly absent from The Last Jedi. While the film’s pace does get a little bogged down during its third act, Solo is ultimately a breezy and exciting Summer blockbuster. It’s exciting, attractively shot, and all-up rather wonderfully performed. It’s still arguable whether a Han Solo prequel was the best use of Disney and Lucasfilm’s time and money, but now that they have released it it is well worth the time. It’s a hell of a lot of fun. hey Grant – you changed my mind and I will try and see this film!